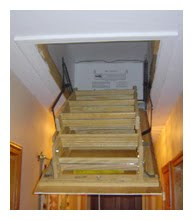 One of the most overlooked areas for leakage in your ceiling is your attic access. While “overlooked” should probably more appropriately stated as “homeowners don’t know how to correct,” the outcome is the same. Homeowners live with the attic access being leaky. Your stairs cover a small area, typically around 8 square feet, but there can be a large amount of leakage around the opening if they don’t fit correctly, and this is 8 square feet of little to no insulation. It's an area that is most typically unconsciously perceived as an uncomfortable area - but most homeowners don’t know why. Also, most homeowners don’t realize that they can purchase or build an item called a battic cover that will seal and insulate their access stairs. A purchased battic cover typically consists of a cover that can be lifted or unzipped, and possibly insulation. Several companies make these items out of a reflective material that gives the added benefit of a radiant barrier. Typical costs are around $100. Some can be found for less, but they usually don't have insulation included. You can also make one using rigid foam board. This is relatively inexpensive and easy to work with. The cover should be made so that it sets inside the framing for the stairs and allows for clearance of side hinges and folded stairs when it closes. Insulation can also be added to this to beef up the inherent R-value of the material. If preferred, a homeowner could also add a radiant barrier to the exterior of the surface or construct it out of foil-backed foam board. I usually recommend ½” board, but your stairs may allow for more. This can all be built for around $50 unless you want to add the radiant barrier afterwards. So how does a homeowner choose which one to do? It depends on you. Both products require some amount of skill, as the purchased cover still has to be installed. However, the built cover is relatively simple to construct and can be done by someone with moderate to little construction skills. Payback can be a big factor in choosing. Payback will vary by location, but for an area of moderate climate, such as central North Carolina (and assuming R-30 insulation is used), you will see a return of about 1 to 3.5 years, depending on what you use to heat your home, gas, or electricity. Current pricing and efficiencies of the various fuels result in a longer payback for heat pumps. If you live in a colder climate, like Maine, then you'll see a payback of 0.5 to 2 years. Set your thermostat to proper temperatures. Each degree to lower or raise your thermostat can save you 3% in cost! 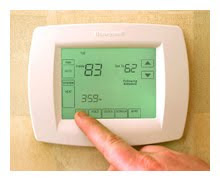 It's recommended that you set your thermostat to 68 degrees in winter and 78 in the summer. You can increase your savings by getting a programmable thermostat. Since most homeowners know about these issues, some are looking for alternatives to the sealed crawlspace. While there are possibly individual solutions to each one of these problems, none of them solve the problem like a sealed crawlspace. There is one solution - the foundation fan - that I have seen used time and time again in an attempt to control moisture. However, it not only fails to eliminate the problem, but will actually increase the issues in the crawlspace. There are several variations to this product, ranging from simple humidity-controlled fans that install in the vents to larger, more powerful fans that are run on timers. Most individuals will sell these fans on the premise that the crawlspace needs more ventilation to “dry” the space. This is the concept on which the foundation vent was based: By providing ventilation under a home, you are able to keep it dry. Here in the South, this is not the case, especially since we began installing plumbing and HVAC in the crawlspace. 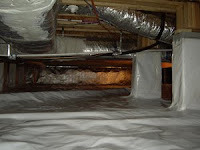 By exposing the crawlspace to the exterior air and having surfaces in the space with lower temperatures, you are just providing an optimum situation for condensation. Condensation occurs when the temperature of the surface is below the dew point of the air. This is the same thing as dew in the morning. When we have surfaces such as plumbing pipes and ducts that will consistently be below the dew point of the outdoor air, we will get condensation of these surfaces. This condensation can wet the other surfaces and cause even greater problems. Wood surfaces can also be affected, and since fungal growth can occur with a humidity over 60%, you increase the risk of providing an environment conducive to growth when introducing the outdoor air. This brings up another aspect of introducing outdoor air, because as you lower the temperature, the relative humidity rises. We can all assume that the crawlspace will typically be cooler than the outdoor air in the summer time, so as the outdoor air comes into the crawlspace, you will actually increase the air's relative humidity. Originally, the idea of a foundation vent fan was to increase the ventilation of the crawlspace; however, all it does is actually increase the moisture content of the space by pulling in more exterior air. Therefore, the fan actually increases the relative humidity and the potential for condensation. Many will argue that the air will help remove the condensation, but as you lower the temperature and raise the humidity, you will actually decrease the amount of moisture the air can even hold. Adding more moisture to it will only increase the dew point temperature. There are several cases I've seen in which a vent fan has been installed to combat a small amount of fungal growth, and actually ended up causing the floor structure to rot! So, if someone tells you that a sealed crawlspace is a bad idea, and that you should instead install a foundation fan, take the time to consider the negatives. If you have a leaky home, think of it as spilling money through the cracks. Most of your loss is through the ceiling, so start looking there first. Seal all ceiling penetrations you can; these include recessed lights, attic stairs, and even standard lights. Next, look to your walls and floors. Last should be your outlets, as they only account for about 2% of the leakage in your home. Need help finding the leaks? As a homeowner, you can feel for drafts, use a candle, or have a professional set up a blower door. 1. Installation of a vapor barrier with sealed joints on the floor, piers, and foundation walls. A minimum of a 6-mil vapor barrier should be installed, with all joints sealed via mastic or an approved tape. It is highly recommended that a higher mil plastic be used because the 6 mil will tend to tear and wear easier. 2. Seal all foundation vents. No vents or openings to the outside should be present, other than an access door. Porch penetrations should also be sealed with an access panel or permanent material. 3. Provide a foundation drain. A foundation drain is needed with a backflow preventer. It is a good idea to allow the drain to accept moisture from above and below the vapor barrier. 4. Insulate the floor or foundation wall. Insulating the foundation wall is more efficient, but either the floor or wall is acceptable. Evaluate the situation and choose accordingly. 5. Air seal duct and floor penetrations. Air sealing the ducts will help improve your home's efficiency, and sealing them and the floor penetrations help prevent air transfer between the home and crawlspace. This also helps with fire safety. 6. Vent appliances to the exterior. Gas appliances should be direct vented or two-pipe vented in the crawlspace. Most vented spaces do not have enough makeup air for single vent appliances, and a sealed one definitely won’t. Direct venting is recommended. There are several variations on this, including the use of HVAC ducts and dehumidifiers. If an HVAC supply duct is to be used, a backdraft damper is needed and no return ducts. This can affect the efficiency of the system, so check with an HVAC contractor prior to doing it. I tend to recommend a dehumidifier, as it is the least problematic. A relative humidity monitor is good addition to help you know that the system is operating properly! This is pretty rudimentary when it comes to energy savings, but there are still a lot of people who are not aren't doing this! Incandescent bulbs convert 90% of their energy to heat and only 10% to light, so they are good heaters but poor light generators. 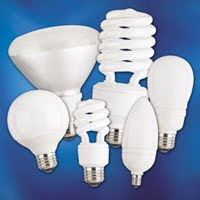 CFLs not only use less energy, but they last longer, too. A 14-watt CFL is equivelent to a 60-watt incandescent. The CFL uses around 75% less energy, and therefore costs 75% less to operate. Also, because the CFL lasts 10x longer, you buy one CFL for every 10 incandescent, which increases your savings. Many will argue that you can't use a CFL everywhere, but they are also becoming more versatile in their uses. So look at your light use and install CFL’s where you can! To Seal or Not to Seal, That is NOT the Question! There are still individuals in the construction industry who will question a sealed or conditioned crawlspace, but this argument should be put to rest: Studies have shown significant improvements in a home's efficiency and environment with the installation of a sealed crawlspace! According to a study conducted by Advanced Energy, sealed crawlspaces, when properly installed, will perform better with relative humidity, wood moisture content, and energy efficiency than a traditional vented crawlspace. The study has shown that during the summer of 2003, the studied sealed crawlspaces only exceeded 70% relative humidity only 5% of the time, while the vented crawlspace stayed above 70% almost all the time. The wood moisture content in the sealed crawlspace stayed below 12% during the study, while the vented crawlspace wood moisture varied greatly. Also, the sealed crawlspaces showed an annual energy use reduction of 15% for sealed crawlspace with insulation on the floors and 18% for sealed crawlspace with insulation on the foundation wall. A sealed crawlspace improves the moisture content of the space by preventing transfer of moisture through three of the main entrance points, the foundation wall, the soil floor, and the foundation vents. By removing moisture from the space, the appeal to subterranean termites is reduced. As already stated from the study, results a sealed crawlspace can improve the efficiency of the home. A good number of contaminates can come from your crawlspace. By cleaning up the space, you may be able to improve the air quality of your home. A sealed space can reduce the mold content in the crawlspace and can be used or modified to prevent radon intrusion. This is an unintended benefit, but due to the increased visibility and improved environment, homeowners are more likely to “visit” the space, leading to better home maintenance. Also, if the insulation is installed on the walls, the floor structure is visible and individuals are more likely to find problems around plumbing or HVAC. Most of your heat loss is through the ceiling of your home; by adding insulation in the attic, you can save energy. Insulation in the attic is relatively easy to install when compared to insulation in other areas, and it can have a greater impact. Here in North Carolina, we are required to have R-30 insulation in the ceilings, but I can see a benefit by increasing this to R-38 or beyond. Be careful, though - there will come a point in which the cost of the additional insulation will not outweigh the benefit of installation! I have found there to be little information available regarding the most common findings during a home inspection. While there are some Top 10 lists available, the ones that I have found are only general, listing such categories as minor structural repairs, plumbing leaks, or grading/drainage problems. To be honest, these general categories are not Top 10’s, but rather a summary of what the home inspector will be looking for during the inspection. When performing an inspection, though I will be looking for items that fall into each one of the categories mentioned, I don’t find that providing this list to the homeowner is very helpful. If everyone knew what to look for within these categories, then the person buying the home wouldn't need to have a home inspector to perform the inspection! In realization of this, I have compiled a Top 5 list from my experience that are relevant to the homeowner. 1. Improperly operating interior doors. This is typically a door that rubs slightly on the jamb or drags the carpet. It is usually a minor repair and is caused by an improper installation, settling, or installation of new flooring. The door is usually easily repaired by trimming or shaving the door slab. 2. Rotten or damaged trim. This can be anywhere around the home, but the most common problems tend to be around exterior doors that are on the ground or not covered, such as a garage or deck entrance. Repairs vary from replacement to repair in some situations. 3. GFCI is not working properly. Surprisingly, this item actually comes up a lot. While it is a simple fix, most individuals do not realize that the safety feature on their electrical system doesn't work, or they would have repaired it. These outlets are in place to prevent an electrical shock, but if they don’t trip, this can’t happen. The solution is typically a new outlet. 4. Improperly operating garage door opener. This is another home safety feature gone awry. Most of the time, the problem is the pressure feature that will return the door if something is under it, but sometimes the sensors that return the door if something has crossed under it are not working either. This is typically a simple adjustment or sometimes replacement of the motion sensors. 5. Fungal growth in the crawlspace. This item can be a discussion all of its’ own, but it is still one of the most common findings in my area of the country. To keep things simple, because the crawlspace is exposed to the environment and has conditions that are conducive to growth, it may have mold in it. How this affects the home and should be treated is again a discussion all of its own and too long for this brief explanation. Repairs for this item will vary significantly based on the scenario. The holidays are upon us, and as the many Christmas trees begin to go up over the next few weeks, everyone can save a little money by using LED lights. If you are anything like me, you have a few strands that aren’t working anyway, but yet you still fight with them every year - trying to find that one bulb that will make that strand work! While savings may be short-term and worth a small amount, they are still savings, and the new lights will last for years to come. Savings will be even greater for all the individuals who take the time to dress the entire home in the festive spirit by placing lights on every eave, doorway, tree, and bush around their home. To all those individuals, thank you for making my holidays a little brighter - both figuratively and literally - as I am still a kid at heart, but take the time and do yourself some good by getting those LED lights. Often, many homeowners - and unfortunately, some energy auditors, as well - overlook the benefits to reducing water consumption in the home. Just like reducing your electrical needs, reducing your water needs can also save you money. The benefits you will receive by reducing your water consumption will vary depending on how you receive your water, but ultimately, there are benefits no matter what the situation! If you are on a well, you may not see the same, direct monetary benefits as someone who pays for their water. However, there are still benefits, primarily in the form of reduced energy consumption through reduced pump use. If you use less water, you will use less energy. Also, in times of drought, you may be able to make it through without your well going dry, saving you the cost of drilling another well. Use the dishwasher instead of hand washing dishes. This may sound counterintuitive, but this does reduce water usage when washing full loads - according to the EPA, as much as 5000 gallons a year! Install a low flow aerator on the kitchen sink. Wash full loads of clothes only! Get rid of the old high volume toilets. Old toilets used 3.5 gallons or more per flush. These can be replaced with low volume or even dual flush. Don’t want to spend the money to replace the toilet? Look for tank flush valve that converts an existing toilet to a dual flush. Install an aerator on the bathroom sink. Install a low flow shower head. Old units can use over 4 gpm. Newer units can help reduce flow to 1.5 gpm without sacrificing power and comfort. Don’t use :"set-and-forget" yard sprinklers. These are the ones that you always set in the yard and leave for hours at a time while you are doing something else. These will overwater the yard and waste your money, not to mention make one section of your yard greener than the rest! Consider automated sprinklers or timers. Use rain or moisture sensors on sprinklers. For those of you who do have automated sprinklers, make sure you have moisture sensors on your units so they don’t come on in the rain or directly after one. Let Mother Nature do her job! Use rain barrels to collect your water for indoor and potted plants. Use spot watering or soaker hoses for your gardens. If you’re not watering by hand, use direct watering means for your plants in the garden. These can be either be soaker hoses or drip irrigation directly at the base of the plants, which eliminates unnecessary watering of the soil (which promotes weed growth, anyway). Set hot water temperature to 120 degrees. Setting your water temperature over 120 degrees can not only cost you money, but it is also a safety hazard. We do not typically use the full temperature of our hot water, so why pay to heat something up when you are only going to cool it down? Once you have had your home tested by a professional, how do you determine if the results are accurate? Hopefully, you have hired an ethical professional who has the proper training and expertise to perform the testing; just in case, as a homeowner, you should have a little understanding on how to interpret the sample results. While there are several different types of samples used in the industry - and just as many sampling devices - two kinds of samples are the most common. These are the non-viable air sample and the surface sample. The non-viable air sample is collected by pulling a known amount of air over a sticky slide. Contents of the air are deposited on the slide. This includes mold spores, insect parts, fibers, and anything else in the air. Some labs report on the other contents of the slide, while some only report on the mold. Several things can be inferred from the additional contents, but to keep this simple, we will concentrate on the mold spores. The spore counts will be listed in the number of spores of a category, spores per cubic meter of a category, total spores, and total spores per cubic meter. The number of spores is the actual number of spores on the slide, while the spores per cubic meter is derived from a formula based on the amount of air pulled over the slide. Both findings are important along with the location of the samples. An outdoor control sample should always be taken, and an air sample should never be taken in an unoccupied zone such as an attic or crawlspace. The sample taken from the investigated area is to be compared to the control sample. Actual counts of spores should also be considered - one spore in the sample can read as 13 spores per cubic meter or more, depending on the amount of air passed over the slide when the sample was taken. One spore may not indicate a problem! I have found surface samples to be one of the most misused samples out there. A surface sample can be used to determine the type of mold present, or if there are a large number of spores on a surface due to cross contamination. However, many people have been using surface samples to indicate abnormal fungal growth. This should not be the case if mold is visible. A surface sample can be taken using a swab, tape lift, or stick slide. All are proper methods of sampling; the only difference is how you record the area sampled. The area sampled is only in question when quantitative results are desired; in most cases, the samples are qualitative and only used to determine what type of mold is present. How results are reported vary by lab, but most use a scale, such as "occasional, few, moderate, numerous." Wording and categories may change between labs, but in this case, "occasional" and "few" would be viewed as normal, while "moderate" and "numerous" would be viewed as abnormal. The scale is typically listed at the bottom of the results. Generally, surface samples should not be used to determine abnormal conditions or remediation protocol. There are two walls in the home, Wall A and Wall B. Wall A has one square inch of mold on it that is very dense, and Wall B is fully covered (80 square feet for an 8x 10 wall), but it is not very dense. Two samples are taken from each wall. The results from Wall A come back with "Numerous" spore levels for one genius of mold, where Wall B comes back with "Moderate" and "Few" spore levels for several genera of mold. According to the samples, Wall A has a problem, while Wall B does not. Someone could determine based on the samples that Wall A needs remediation more than Wall B. In actuality, Wall A has had all the mold removed by the sample, while Wall B has a significant problem. The variation comes from the density and area sampled. This just gives a rudimentary example of why surface samples cannot be used to determine the need for remediation. I see this happening the most in crawlspaces, with recommendations being made over the density of the growth - not the actual coverage area. With surface samples, only take them for what they can actually tell you. Again, as a homeowner, don’t be afraid to ask questions or get a second opinion! This may seem like a simple item, but many people forget about it. Check around your windows and doors and see if they are leaking, or if you can see daylight. If so, install weather stripping to seal this up! There are various types, and each one has it use. Ask someone at your local hardware store which one works for your situation or you can research your options online. Also, while door socks can help, many people will remove them in the summer. Just because you are not uncomfortable in the summer with the draft under the door, it's still there and costing you money! If you do this, also remember to pick up a door sweep while you are at the store getting your other weather stripping supplies. This is a very common question among homeowners. Concerns for fungal growth or mold often arise when an unfamiliar odor is noticed or a small leak occurs, and at that time one starts to investigate how to prevent the growth from occurring! I am often asked if there is a special treatment or construction product that can be used to prevent fungal growth in the home. While there are products on the market that are resistant or retard growth, there are even simpler solutions to prevention. Common sense would prompt the thought that for if spores are everywhere, then why even discuss this? Of course, spores are one of the four items that are required for growth, and there is little that can be done to prevent them from being in the air. What should be understood is that if you have some growth in the home, remove it - you don’t want to increase the number of spores that are there. I have had several individuals ask if they could just leave the mold growth if they removed one of the other three items required for growth; the answer is no. If you leave the growth, you have left spores on the surface; if you reintroduce optimum conditions for growth, you have just created a bigger problem because there are more spores present than under normal conditions. The bottom line is that you can do little to prevent the number of spores in the home; however, if you have growth, no matter how little, remove it before you just create a bigger problem if the conditions that are conducive to growth become favorable. This is the one item that is hard to control, and in all actuality, you really can’t. Though there are some species of mold that like to grow outside of our comfortable temperature range for living, many grow in the same temperature range that we like to inhabit, so there is not much that we can do. I am often asked if someone can cool or heat a home to help with the growth. There is some possibility to this, but often the range that inhibits (or prohibits) growth is out of our comfort range, so this is difficult to do. Like all living organisms, fungus needs something to "eat" to grow. This comes down to organic material, which is often drywall paper and wood in our homes. Things that are not organic and will not support fungal growth for the most part are bricks, stones, and fiberglass. These objects do not have nutritional value for the fungal growth, and for the most part will not support it. However, dust and dirt collected on these items can have nutritional value, so there can be an exception to this rule. If we build our homes primarily out of material that supports growth, how do we eliminate this item? For the most part, we can’t, but this is where all the new materials on the market can help, such as fungal-resistant wall board and the variety of products that have Microban as a component. We can limit the nutritional value in the products we use, but again, this is something that comes along with the construction of the home, so it is less of a preventative measure in older homes. This is the most preventable of the four items in preventing fungal growth from ever occurring. Stop the moisture in the home! If you have a water leak, correct it and dry out the area. If you have water intrusion through your basement wall, stop it. Plain and simple, keep your home dry. Most homeowners understand this and do well with stopping the large water intrusions. Some of us could do a little better at doing maintenance inspections to find leaks, but again, for the most part, active leaks are typically corrected. Sometimes catastrophic damage occurs from a water line breaking or when piece of equipment malfunctions, such as a dishwasher. This cannot always be prevented, but there are items on the market that can help reduce the likelihood of the damage being significant, as well as good practices with preventive maintenance. The one moisture source that most homeowners overlook is humidity. We all know how high humidity affects us, especially in the south, but mold likes a relative humidity above 60%. If your air conditioner is not properly operating and removing the moisture from the air in the summertime, or even in some cases putting more moisture into the air, you can have a mold problem without ever having water damage. The solution to this is to monitor your relative humidity and make sure the air conditioner is functioning properly. A radiant barrier in your attic does not add to the insulation value of the attic, but it does help manage radiant heat. Radiant heat is the warmth we feel when standing in the sunlight. In the summertime, we want to keep this out, and in the wintertime we want to keep it in. Depending on the installation of the barrier, you can achieve both of these functions and reduce the heating and cooling cost of the home. Can I Test My Home For Mold Myself? Do Self Test Kits Work? Mold is a very common concern when dealing with indoor air quality. Many homeowners will believe that an odor or the reason they are feeling sick is due to mold without ever seeing the growth. The truth of the matter is that I find mold in only about 30% of the "unknown odor" cases I investigate! Often, the odor is coming from other sources, or it eventually goes away and the source is never discovered. The percentages are even smaller when it comes to a sickness in the home. Often times, these are truly resulting from work stress, lighting, or other factors in the home. While it is not as common as it used to be, I still come across scenarios in which the concern has been increased due to the use of a home test kit. These test kits typically consist of two petri dishes that are set out for a period of time. One is used as a control outside, and one is the sample of concern. These tests work off the idea that spores will settle out of the air over a period of time and grow on the auger in the dish. Mold is everywhere! Contrary to what many homeowners may believe, there are many spores in your home. These spores are brought in through the air exchanges in the home, on your clothes, the HVAC system, and anything else that has air in or around it. Just because there is mold in the dish does not mean that there is a problem in the home. A control of the outside is needed for comparison. In a normal environment, the indoor sample and the outdoor sample should have a similar composition; spore levels in the indoor sample should be equal to or less than the outdoor one, and any variations from inside should be small or of a type that is not considered a water damage mold. Self-test kits did get one thing right by providing the exterior control, but there are other flaws. 2. A known volume of air must be passed over the samples. Using petri dishes as a collection media is not a problem, as it is used in viable testing (living specimens are able to grow). However, the issue with the self-test kits is that there is no known volume. You know the time, as the homeowner will write down the hours the dishes were left out, but how much air passed over the dishes? Were fans on in the room, was an HVAC duct blowing on the dish, was there a lot of movement in the room, was the wind blowing outside? All these are factors that will impact the amount of air moving over the dish and the spores it may be exposed to. Some could argue that these are settled dishes and movement of air will lessen the amount of spores; however, this is still an issue with the accuracy of the dishes, as we don’t know the volume of air sampled and therefore do not know if you can accurately compare the interior and exterior sample. This test is only looking for viable or living spores. What about the non-viable ones, or total counts? When looking at the indoor air quality of the home, all spores are of a concern because even non-viable spores can have health effects. While this is a minor concern with the self-test kits, it is still a concern, because looking at only viable samplings can misconstrue findings. Typically non-viable samples are taken first to determine if there is a problem, and then viable are used if further investigation is needed for specific species of mold. The home test kits are usually interpreted at the lab. While this is not necessarily a bad thing, I have often seen any variation in levels labeled as abnormal. When someone is interpreting results from a lab, they have not seen the home and cannot make assessments based on conditions in the home. I will say that their assessment may not be incorrect; I just caution that there may be other influences in the home that are causing a variation and are not attributed to actual growth. I will often review samples taken by other individuals and make comments on them, but I always caution that in order to make an accurate assessment you have to be at the home at the time of the sampling. I have intentionally taken samples as less than optimum locations in the past to see how sample results vary. A specific one that comes to mind is one I took near a bowl of rotting fruit. The fruit had visible growth on it, and the results showed elevations as compared to the outdoors. Had someone read these in a lab and had not been present in the home, they may have said there was an abnormality - when in actuality, someone just needed to get rid of some fruit! This saves in several different ways, depending on your situation: By installing low flow faucets and toilets, you can save money on your water bill, you can save power by not running your pump as often, and you can save by not using as much hot water. Many people are becoming familiar with Energy Star certification for their home, but I still have conversations with individuals who aren't sure about the process or what it really means. It is really great that everyone is interested about Energy Star, but we really need to get adequate information out so that everyone is familiar with the process and how you go about having your home certified! The first thing to know is that building a home that is Energy Star compliant does not cost significantly more than constructing a standard home. There are only a few items that need to be done, depending on your climate zone, that your builder may not already be doing. This is usually a air sealing and just a few insulating techniques dealing with air barriers. These items, again, do not add a significant amount of money. Secondly, having your home certified does incur a fee. The party that verifies the construction and certifies it will charge a fee for their service. The individuals that perform this service are HERS raters. A HERS rater has been trained and tested to prove that they understand the building process required by Energy Star and how to properly test the home. The fee ranges, but there are some programs available depending on your location that provides assistance or rebates for this service. To get your home certified as Energy Star, you have to score an 85 in the southern part of the country and an 80 in the northern. A detailed chart and more information are available at http://www.energystar.gov/ that shows which region you are in. The score means that you are respectively 15% and 20% more efficient than a home that is built to code. Again, this is relatively easy to achieve. A lower score is a better score. The certification for energy star requires two inspections. A thermal bypass inspection occurs pre-drywall, and a final that tests the tightness of the home. I have had several builders miss the pre-drywall due to them not fully understanding the process and not being willing to let you know or ask questions. I have also had several homeowners contact me because they were informed that they only needed the final. This is a very critical point and evidently there is a large amount of misinformation out there as to how the process works. The thermal bypass inspection is to verify the insulation and air barriers are installed correctly. Also, at this time, the HERS rater will evaluate the air sealing and give any tips on what else can be done to make the home tight. Air sealing is not specifically on the checklist and does not have to be inspected, but it is important, so we still tend to make comments regarding it. If the HVAC contractor is ready, the duct test can be performed at this time so that any leakage can be fixed prior to drywall. The final inspection will consist of the blower door and duct blaster, if it was not done at thepre-drywall stage. 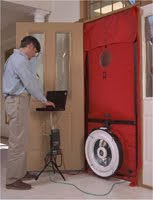 The blower door checks the tightness of the home and the duct blaster does the same for the ducts. The equipment pulls air out of the home and ducts and we are able to measure the amount of air that flows through, telling us how leaking the home or ducts are. The final step that you will not see is the modeling. There are two paths that you can take to get Energy Star certification: the Performance path and the Builder Option path. With the performance path, you must model the home, and with the builder option, you must meet certain requirements. Most individuals go with the performance path, as it is more flexible; with this path your home is modeled using software and given a score. This is a very brief overview of the process, and there are other details that you will need to know if you are to construct an Energy Star home. However, this provides more than many know about the basics, and it allows you to get started with the process. If you are going to build an Energy Star home, contact a local HERS rater prior to starting construction to discuss the process with them! Many people know about this, and most do it if they have a chance of freezing their cold water pipes; however, you can benefit by insulating all water pipes, and the biggest gain actually comes from the hot water pipes. Just like I discussed last week with the water heater, the temperature difference between the hot water and the ambient temperature is significant no matter where the pipes run. By insulating the pipes, you slow the cooling of the pipes and therefore conserve energy and water. Most individuals believe that the more ventilation, the better when it comes to the attic, and others wonder why they even have to ventilate the attic. The truth to all this is that it varies between regions of the country and systems that you see installed every day may not actually be functioning the way they were intended. In the north, attic ventilation is used to prevent ice damming. This is when the snow on the roof melts at the higher regions of the roof and then refreezes at the gutters. This can lead to water damage in the home. In the south, the attic ventilation is used to reduce the temperature in the attic to help with the cooling load on the home. The main idea that needs to be taken from this is that with traditional construction the attic needs to be vented no matter where you are located. Building code will typically requires a certain ratio of net free ventilation area (NFVA). Depending on where you live, this can be anywhere from 1 to 300 to 1 to 150. There are several methods of venting the attic, but the most common methods that I see are ridge and soffit vents, gable vents, and powered attic fans or ventilators. Each of these systems are used as standalone systems, and at times they are used in conjunction with each other. 1. Soffit and Ridge vents must not be used with gable vents. 2. Powered ventilators may not save you money and can cause problems. A study conducted by the Bureau of Standards found that the cost of operating power ventilators did not outweigh the minimum savings in cooling cost due to the decrease in the attic temperature. The use of solar-powered ventilators may correct this issue, but then you must weigh the cost of the unit vs. the savings in cooling cost. Powered ventilators have other issues that include depressurization of the home. This can cause backdrafting and moisture problems in the home if there is not enough ventilation in the attic to accommodate the fan or if the ceiling in the home is not tight. Even if the fan is not powerful enough to depressurize the home, it can still pull conditioned air out of the house through leaks in the ceiling and therefore cost you more money to cool the home. Powered ventilators must be used with caution, and I do not recommend them except in extreme situations. Ventilation is important if you intend to stay with a vented attic. Shingle manufacturers may void warranties, and you can cause damage to the roof sheeting if the ventilation is not sufficient. The important item with any system you install is to make sure that it is installed per manufacturers instruction and local building codes. As mentioned before, a good source of information regarding natural ventilation and the various types of vents is the manufacturer Cor-A-Vent. The Energy Star Website and Advanced Energy also have resources regarding attic ventilation. Many people will argue on this subject for various reasons, but the most common two arguments are that the water heater doesn’t feel warm and the water heater is in the home and therefore doesn’t need a blanket. The truth is that at 120 degrees Fahrenheit, your 75 degree home looks really good to the heat in the tank. No matter where the tank is, it will lose heat. As for the argument that it doesn’t feel hot to the touch, the truth is that tanks are becoming more efficient with their insulation, but they will still lose some heat. If you don’t believe this, put some towels on the top of the tank, come back after a day, and put your hand under them to see if they are warm. A water heater with R-7 insulation at 130 degrees Fahrenheit can potentially save $33.10 a year based on a $0.10 kWh electric rate. This is not a bad return on a $15 blanket! If you are going to wrap with a blanket, make sure you do it right and follow any instructions from the manufacturer. If your tank is fueled by gas, there are additional measures you need to be aware of, so make sure you take the time to learn how to install the blanket safely on your system, or have someone experienced install it for you. Over the past few weeks while researching ideas for this blog, I have noticed a trend in the media sources I have consulted. Often times, these sources are online; as we all know, online sources may not always be that reliable! With trends being what they are today, many people turn to the Internet to gather information regarding potential purchases and to educate themselves on topics of interest. As energy efficiency and sustainability are hot topics at the moment, many companies are trying to capitalize on this. 1. Any time a research paper is cited, find that document. In an attempt to prove my stance on powered attic ventilators (of which I will go more in-depth at a later time, but for now let it be know I am against them), I discovered a disturbing trend among marketing material. Several companies used quotes from a research study conducted by the Bureau of Standards. In this study, the bureau found that the attic ventilators did not create a significant enough reduction in the attic temperature to offset their power usage; however, several companies have cited this research paper as a reason to use their product. 2. Don’t trust a single statement. This is not meant to imply that you should be skeptical, but consider all arguments! For some products, there are several opinions by very reputable individuals - just because they are different doesn’t necessary make one right or wrong. Products have different properties, and what one individual may consider a poor product another may consider a good choice for their situation. This argument can range anywhere from radiant barriers to concrete countertops, but the best one I can use to prove my point in bamboo flooring. While the majority of the people consider this to a very green product, it may depend on who you listen to. Bamboo is a highly renewable resource, with maturity at 7 years compared to hardwoods at 30+. However, the bamboo is mostly grown in Asia and must be shipped, causing it to have an extremely high embodied energy. Is bamboo sustainable? It all depends on how you look at the big picture. 3. Look at the source. This ties into the previous two statements and can also be stated as "what makes an expert." There are times in which the various components of the building community disagree with each other. So how do you determine who is the expert in the whole process? Look at the source, determine their experience, and use your own judgment. Just because someone has been building houses all their life, they’ve been to school for 30 years, or they write an article or blog on the Internet doesn’t automatically mean they have all the right answers! I was once told a story about a class that spent an hour lecture listening to the professor explain how the sky was actually orange and not really blue. This class never once questioned the professor because he was perceived as the expert. The next day, the professor quizzed the individuals on the previous lecture and they all failed because they answered that the sky was orange. The professor wanted to prove a point - just because he was perceived as an expert doesn’t necessarily make him right! The class learned an important lesson to use their own minds and never be afraid to question even a perceived authority. This is a simple little tip, but many individuals don’t realize how much heating your water can cost! Clothes don’t necessarily have to be washed in hot water. There are many detergents on the market that work just as well with cold water as they do with hot, and some are becoming specialized for cold wash cycles. As with all recommendations, there are exceptions that require the use of hot water - and I have come across some of these, including the need to reduce certain allergens - but for most laundry cycles, cold water can be used. This alone could potentially save you quite a bit on your utility bills! When Should I Go Green? If your walls are open and you are performing repairs, why aren't you at least adding a few efficiency or sustainable features? I always tell my clients that the time to make adjustments is while you're working on your home! For years I worked in insurance restoration, and we always told homeowners that you can turn a bad situation into a good one by making improvements you had always wanted to do. The same goes for any type of work when you are considering sustainable improvements. I understand that when someone is performing a remodel that there can be big cost associated with it, but some items cost little to nothing to perform. Here are five items to consider - and remember there are hundreds more. Just look at your situation and make improvements accordingly. If your walls are open, make sure your insulation is correctly installed, and beef it up a little if possible. This cost: little to nothing more than what it is costing you to replace the insulation, anyway. 2. Caulk joints and seams in the walls. Make sure you limit the air leakage in your home. Having the walls open is an opportune time to stop leakage, even if it is one or two walls. Don’t send your old materials to the dump if they are reusable! Someone may have a good home for that old toilet or cabinet. Almost all remodels include paint. Make sure you use one that will not emit gas. A lot of individuals look only a few years down the road. Consider what you would need if your family grew or an unfortunate accident caused someone to be handicapped, and make adjustments or plans for the future (i.e. block for handicap bars in the bathroom, increased door sizes to allow for a wheelchair, or make adjustments for a office to be easily turned into a bedroom). This is a classic excuse, and believe me, I understand how people may feel! However, this is easier than you think. You don’t have to take a lot of time to make these improvements; in fact, many improvements are as simple as changing your habits. Here are five items that you can start today. This one is self explanatory, but you would be surprised how many people still don’t do this! 2. Label your appliances with replacement information. 3. Turn off your ceiling fans when not in the room. Again, this one is self explanatory, and for those of you who already know me, you won't be surprised at this one! Just a small change in temperature on your thermostat can make a big difference in the cost to heat and cool your home. Set the winter temperature to 68 degrees and the summer to 78 degrees. 5. Adjust your freezer/refrigerator temperatures. Setting the temperatures on your refrigerator can help make it run more efficiently. The refrigerator should be between 36 and 40 degrees and the freezer between 0 and 5 degrees. I have no explanation for this comment. If you thought your HVAC wasn’t running correctly or you had rotted siding, you wouldn’t ignore them and not call professionals just because you were worried how bad it really is. If you don’t have the funds for an expert to assess your home, then educate yourself and look for the deficiencies, but please don’t ignore them! There are plenty of things you can do to improve your home that don’t cost a lot. Many people still do not have a programmable thermostat, and some that do still aren't using them to their full potential. According to the EPA, a programmable thermostat can save you $150 a year. Based on current prices, if you can install the thermostat yourself, this give a 6-month payback; if you can’t, the payback will still only be one to two years, which is still great! If you already have one, then make sure you have it programmed correctly. Have it adjust the temperature while you are out of the home and at night. If you are not doing this, then you are not saving yourself the money that you could be. Many people have them programmed incorrectly because they have different schedules than what their thermostat may have allowed for, such as working Wednesday thru Sunday instead of the standard work week. The thermostats are becoming more flexible, with some allowing for day-to-day changes instead of the week and weekend schedule many people are used to. So, if you have this situation, check into a different model to see if it can work with your schedule.